The average proportion of overdue B2B invoices reported by respondents in Belgium increased for the third consecutive year in a row and stands at 45.6%. The proportion of domestic and foreign past due B2B invoices in Belgium increased for the third consecutive year. Suppliers in Belgium said that payment delays occurred mainly because of insufficient availability of funds and buyers using outstanding invoices as a form of financing. 17.9% of respondents said that they needed to pursue additional financing and 16.3% that they needed to take specific measures to correct cash flow because of overdue invoices. For 15.8% of respondents, the impact of past due invoices was even more severe and led to revenue loss. Among the Western European countries surveyed, respondents in Belgium are some of the very few who increased their credit sales slightly. The average proportion of total B2B sales made on credit increased from 31.8% in 2017 to 32.5% this year. Respondents in the country seem just as comfortable selling on credit to domestic B2B customers as they are to foreign B2B customers. Respondents in Belgium said that they opt for credit sales if they trust their domestic B2B customers or to build long-term relationships with new customers. They also agree that this is a much easier, convenient way of trading. 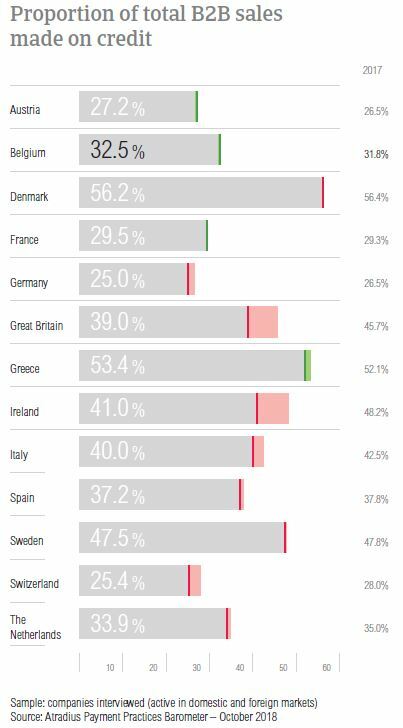 Looking at the reasons why Belgian suppliers would refuse granting trade credit, the main ones are the poor payment behaviour of the customer (mentioned by 32.6% of respondents) and the financial weakness of the customer (20.9%). We trade on credit with our domestic B2B customers to maintain customer loyalty, improve trading relationships and because this is much easier. The most frequent reasons for granting trade credit to foreign B2B buyers mirror those of domestic customers – it’s considered easier and more flexible, to reward loyal customers and to attract new business. The financial weakness of the customer, poor payment behaviour and high economic and political risk in the customer’s country are the primary reasons why respondents would not sell on credit to their foreign B2B customers (39.4% mentioned the first reason; the latter two were cited by 24.2% of respondents). We chose this method for the ease of payment. 92.5% of respondents in Belgium have reported late payments from their B2B customers. While this marks a decrease from 93.6% in 2017, Belgium still had one of the highest percentages in the region. Survey responses suggest that foreign B2B customers pay late as frequently as domestic B2B customers do. 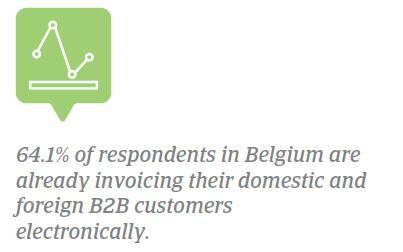 The average proportion of overdue B2B invoices reported by respondents in Belgium increased almost four percentage points from 42.0% in 2017 to 45.6% this year. The average Days Sales Outstanding (DSO) figure in Belgium dropped from 50 days in 2017 to 48 days this year. 50.0% of respondents said that they do not expect changes in the coming 12 months. Of those who do foresee changes, 27.1% expect an increase and 22.9% a decrease. Payment terms this year for both domestic and foreign B2B customers have decreased slightly. Domestic B2B customers are given, on average, 25 days to settle their invoices; three days less than in 2017. Foreign B2B customers are given, on average, 28 days to fulfil their payment obligations; four days less than in 2017. The small difference between domestic and foreign B2B customers was also consistent with the 38.5% response rate that domestic B2B customers are likely to receive less time to settle their invoices. In contrast, 16.8% of respondents said that they are giving domestic customers more time to pay than what they give to foreign customers. 44.7% of suppliers in Belgium said that they usually don’t differentiate payment terms. The main reasons for differentiating payment terms in Belgium are internal policies, industry practices and domestic payment terms dictated by law. In 2018, the average payment delay by domestic B2B customers increased by one day (31 days) and by eight days by foreign B2B customers (on average, 28 days). 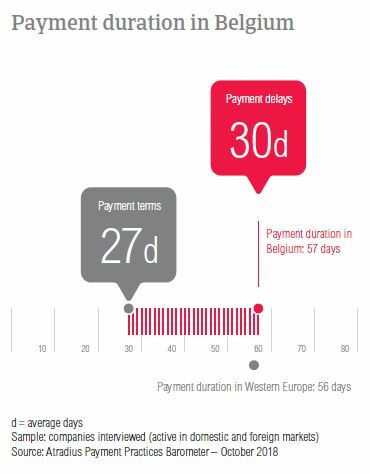 Based on the changes in payment delays and payment terms, the average payment duration in Belgium increased from 55 days in 2017 to 57 days this year. Domestic payment delays occurred mainly because of insufficient availability of funds (reported by 45.2% of Belgian respondents) and buyers using outstanding invoices as a form of financing. The percentage of respondents stating this later reason increased significantly, from 27.1% in 2017 to 34.1% this year (regional average of 30.9%). This is one of the highest percentages in the region. Looking at the main reasons for payment delays by foreign B2B customers, 31.0% of Belgian respondents reported insufficient availability of funds and 27.6% the complexity of the payment procedure. Both these percentages are in line with what was reported at regional level (31.7% and 27.3% respectively). 15.8% of respondents in Belgium stated that payment delays led to revenue loss. A slightly higher percentage said that in order to manage the impact of overdue B2B invoices, they had to pursue additional financing (17.9%) and take specific measures to correct cash flow (16.3%). 38.6% reported that overdue B2B invoices did not have a significant effect on their businesses. The majority of respondents in Belgium (64.1%) said that they are invoicing their B2B customers electronically. Additionally, 16.0% said that they are not yet invoicing electronically but they intend to start doing so in 2018. 17.5% of respondents said that they are not invoicing electronically and 2.4% that they are no longer sending invoices online. 53.8% of Belgian respondents said that after invoicing their B2B customers electronically, they received payments quicker. In contrast, 4.6% cited slower payments of invoices and 41.7% no noteworthy effect on payment duration. Along with their peers in Western Europe, respondents in Belgium were asked to rank the following potential risks to global economic growth in order of significance: US protectionism turning into a trade war, misguided Fed policy, a ‘hard landing’ in China and geopolitical risk. 46.6% of Belgian respondents (regional average 44.8%) said that US protectionism is the most significant risk to global economic growth over the coming 12 months. Another 18.3% agree that, while US protectionism potentially turning into a trade war is a significant risk, it probably isn’t the most significant one. 20.2% perceived geopolitical risk as the most significant. In 2018, the average proportion of uncollectable receivables in Belgium remained stable at 1.0% (0.9% in 2017). Domestic B2B receivables were written off more often than foreign B2B receivables. 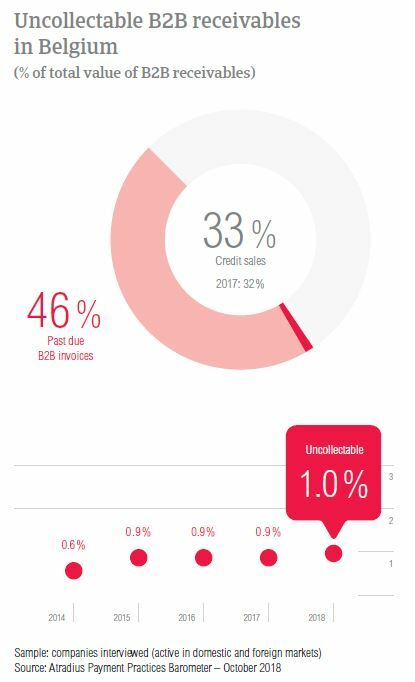 Uncollectable receivables originated most often from B2B customers in the construction, consumer durables, services and business services sectors. 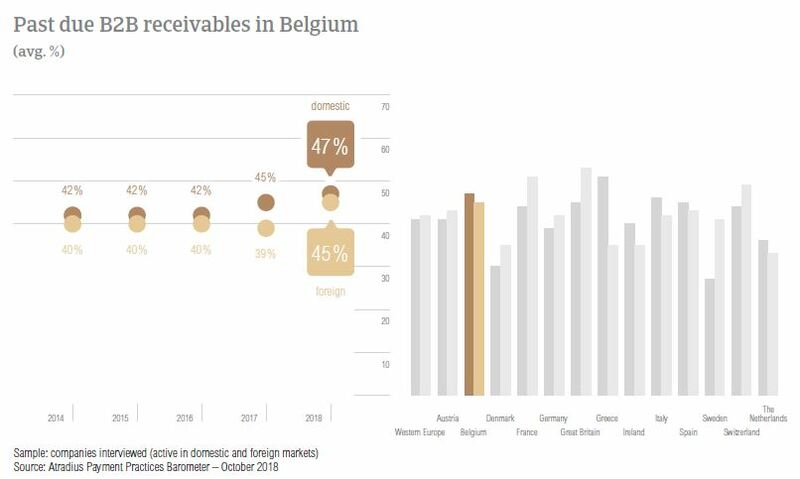 Despite a significant decrease in the percentage of Belgian respondents who reported bankruptcy from 60.0% in 2017 to 48.8% in 2018, this remains the top reason why B2B receivables were uncollectable. An increased percentage of Belgian respondents (30.4%) reported that the main reason for write-offs was the high cost of pursuing the debtors. 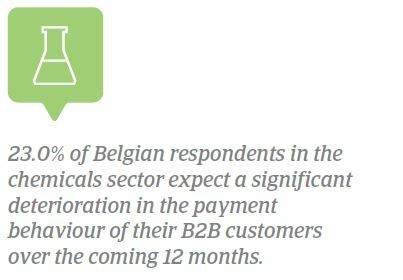 As mentioned previously, Belgian respondents give their B2B customers 27 days, on average, to fulfil their payment obligations. In 2018, B2B customers in the paper and textiles sectors enjoyed longer average payment terms (57 days and 41 days respectively). In contrast, B2B customers in the construction materials and food sectors are asked to pay much faster (on average, within 15 and 19 days respectively). Suppliers in Belgium reported that B2B customers in the consumer durables and chemicals sectors are some of the slowest payers. B2B customers in these sectors, paid on average 44 and 24 days after the due date. The main reasons behind payment delays in the consumer durables sector are the inefficiencies of the banking system (reported by 33.0% of respondents) and buyers using outstanding invoices as a form of financing (mentioned by 27.0% of respondents). Suppliers in the chemicals industry said that their customers delayed payments most often because the goods delivered or services provided did not correspond to what was agreed in the contract (33.0% of respondents). 27.0% of respondents said that delays occurred because buyers used outstanding invoices as a form of financing or the invoice was sent to the wrong person. Looking ahead, most respondents in Belgium (46.0% and 59.0% respectively) expect the payment behaviour of their B2B customers in the consumer durables and chemicals sectors to remain stable in the coming 12 months. Should changes occur, most respondents expect these to be for the worse. In 2018 the number of Belgian business insolvencies will still be higher than the levels seen before the start of the global credit crisis in 2008. Having drawn from the expertise of Atradius Collections' local offices, the International Debt Collections Handbook explains the different regulations and procedures for debt collections in Belgium.